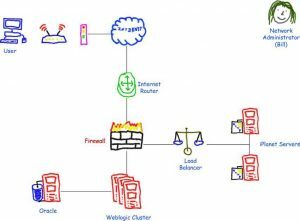 …It actually all started earlier this week when we were criticized for not having an electronic copy of the diagram for how to put in our new VPN solution–even though it was simple to explain, and we did have a detailed sketch of it on poster paper. When I was told about the whining, I joked that I should draw the thing in Paint and give it to them since they don’t understand simple concepts. 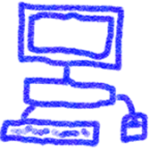 This irritation did not go away, so I went online to for Visio Stencils drawn in crayon. After an hour of no luck, I stopped being lazy and created my own, using a crayon brush in Adobe Fireworks, and free-handing it with my mouse. Then I created a new Stencil in Visio, imported the graphics and copied them over to master shapes. The initial prototype got a lot of laughs in the office, and from friends that I sent it to. So, I actually took a 15 minute task, and turned it into a few hours of work. But the point that was made was well worth it. Oddly enough, the passive-aggressive approach was well-received by my manager…but I’m sure I’ll see the diagram again in my next performance review. That is when I decided that keeping this stencil set to myself and my circle of friends was not the right thing to do, since I am 100% sure I am not the only one who feels like he is explaining simple concepts to people with a 3rd grade mentality. Don took advantage of the fact that bitmaps and images can be turned into Visio shapes. 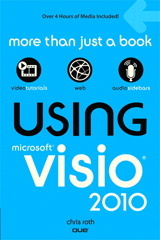 It’s just a matter of importing them into Visio. You can then add connection points, Shape Data fields, and other Visio Smart Goodies to the shapes. For the Crayon Network shapes, we’ve added four connection points to aid in connecting the shapes to each other. Don said that he may be updating and extending the Crayon Network shapes, so you might find a URL added to this article in the near future. It will point to the latest-and-greatest version of the stencil. 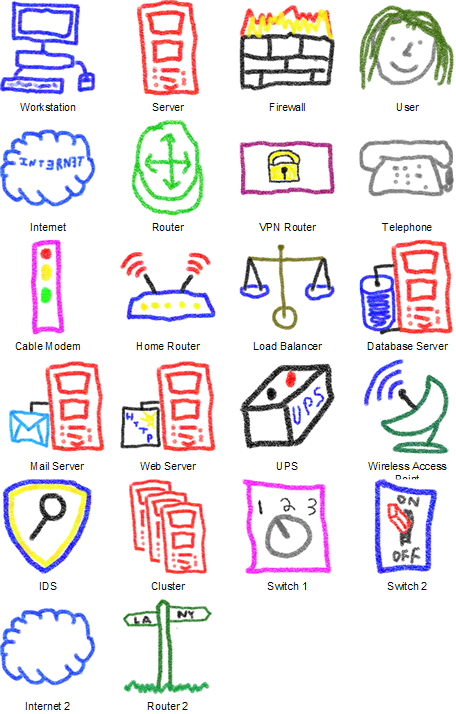 There is a new version of the Crayon Visio Network Shapes. See Crayon Visio Network Shapes, Revisited. Finally a stencil that actually has an exact copy of the network components we use when developing a client’s network. Only thing missing is the table napkin and some beer. Tom, I think you could probably find a background image to simulate the napkin texture. Failing that, crumple up the printout a few times. Fantastic! But my home network drawing is incomplete because there are no shapes for Internet enabled TVs, DVD players, game consoles or laptops. Still a whole lot of fun. I had to draw our mail routing for a colleague. The look on his face and the laughs… especially when looking at the ‘user’ shape. ROFL! tx a lot!